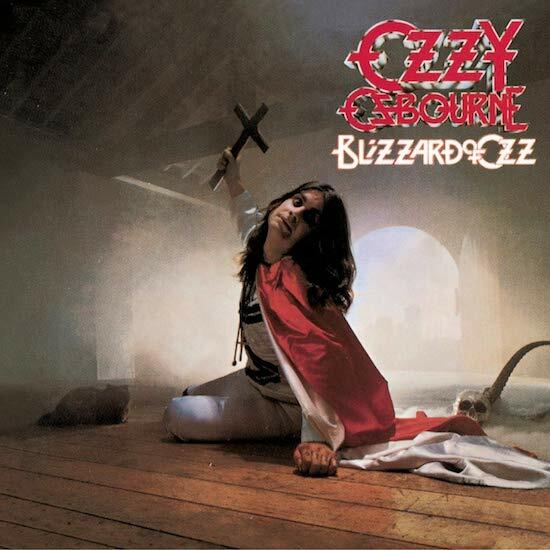 Ozzy Osbourne’s debut solo album, 1980’s Blizzard Of Ozz, has been certified quintuple platinum in the U.S. by the RIAA (Recording Industry Association of America) after accumulating five million certified units. The February 4th recognition comes more than two decades since the LP was certified quadruple platinum (August 15, 1997). Also certified on February 4th was Ozzy‘s 2003 greatest-hits album, “The Essential Ozzy Osbourne”, which went double platinum after accumulating two million certified units. That collection was previously certified platinum on March 3rd, 2016. The albums restored the bass and drum tracks played respectively by Bob Daisley and Lee Kerslake, which were controversially removed for a 2002 reissue by Ozzy’s wife and manager Sharon over a royalties dispute. The Blizzard Of Ozz reissue came with three bonus studio tracks, including an alternate version of Goodbye To Romance and a song never previously released in the U.S. called You Looking At Me, Looking At You. Sharon has hit some home runs, but she also has made some huge errors, and what she did with replacing Bob and Lee on BOZ and DOAM was by far the biggest error she ever made! Thank God it was corrected!! I wonder if Randy had lived, if she would have had the cojones to pull that greedy stunt? I highly doubt it. But then again with Sharon, you never know. True, but like you, I think she might have been a bit more measured. One of the greatest rock/metal albums from 1980. Sabbath’s “Heaven and Hell”, Judas Priest’s “British Steel, AC/DC’s “Back in Black”, Iron Maiden’s 1st album, Van Halen’s “Women and Children First”, Diamond Head’s “White Album”, Angel Witch’s 1st album, etc….such a great year for music! So will Kerslake and Daisley get another Platinum plaque like Ozzy will? Maybe I’m wrong about this idea, but if the albums have reached platinum status 4 timis over, couldn’t Ozzmn and Co have given Kerslake his platinum plaque long, long ago if he potentially has 4 of them already? Greedy pigs! how about Sharon release that OZZY /Randy capital theatre NJ video??? that venue releases shows form nearly everybody!! !